The Broaddus Bulldog bass fishing team did not waste their backyard advantage at the inaugural Deep East Texas High School Fishing Series tournament on Saturday at Jackson Hill Marina. Fourteen high schools from East Texas and as far away as Houston and Monroe Louisiana sent teams to compete for bragging rights, prizes and educational awards. After a very tough day on the water dodging thunderstorms and increasing winds the high school anglers found it difficult to coax the bigger fish from their hideouts. When it was all over the Broaddus Bulldogs took the top two spots with brothers Randy and Robert Morgan bringing in four fish that weighed 11.56 lbs as well as the Big Bass for the tournament weighing 6.10lbs. They were followed by Thomas Vardeman and Zaryon Price with 9.79 lbs. Third place went to the Team of Nolan Haney and Dalton Marsh from the Deweyville Pirates with 9.78 and fourth place was anchored by the Bears Reece Solis and Tyler Freeman from the Little Cypress Mauriceville fishing club with 9.27 lbs. “What other high school sport can bring together this many schools, student anglers and families to enjoy a day of friendly competition?” asked Terry Sympson tournament director. 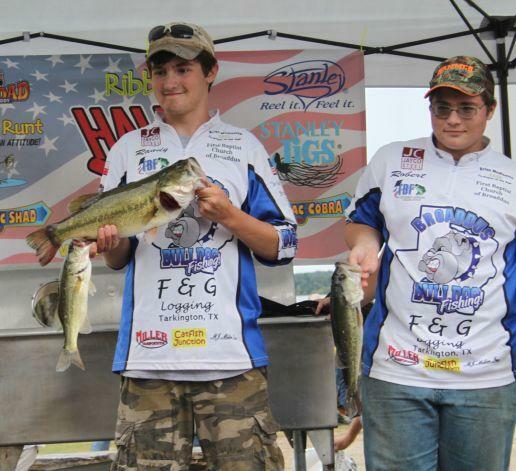 “Unlike other competitive sports, high school fishing brings out people that cheer for all of the kids as they get their turn to walk up on the stage to weigh their fish and tell about the big one that got away”. The student anglers were treated to a hands-on fishing clinic with Hall of Fame bass fisherman Tommy Martin as well as legendary angler and lure designer Lonnie Stanley and John Hale as they took turns on the Tommy Martin Challenge Casting Skills Course. Lonnie Stanley reported that “many of these kids have casting skills as good as I had when I first started fishing professionally”. Awards were given out to the top three teams as well as big bass and to the top casting course winners. It was also announced that the first Toledo Bend tournament needed to be rescheduled because Fin and Feather resort had accidentally booked three other major events for the same weekend. ‘We just do not want our kids having to compete with all of the other events for their safety and convenience” Sympson added. “We will announce the rescheduled date within the next week so everyone can plan their schedules. The series schedule includes 12 qualifying tournaments to be held on both Sam Rayburn and Toledo Bend. To qualify for the Championship each team will use their six best performances. “This is designed to allow anglers to better manage their busy schedules and still have a chance to qualify” Terry Sympson explained. The series will culminate with a May 9th-10th Deep East Series Championship that will be held on both Toledo Bend and Sam Rayburn and the third National High School Open in June sponsored by The Bass Federation and FLW. Even though Deep East club membership has only been open for a few weeks almost 20 high schools have joined or are currently forming high school clubs that will be competing in the Deep East Series. The series plans on sponsoring several teams to compete in advanced Nationally sanctioned tournaments both with FLW and BASS as part of the Deep East Series awards and will also be giving other educational awards and fishing prize packages to the student anglers. To find out more about the fishing series you can go www.deepeasthighschoolfishing.com.